Even the most well-intentioned brands find exploitation in their apparel supply chains. And now, in this era of fast fashion – with hurried turnaround time for new styles to hit shelves – the situation is only getting worse. Most companies conduct spot checks on their first-tier factory suppliers, yet the problems exist at the bottom of the production chain where companies lack visibility. Corporate sustainability and sourcing officers are unaware of the pressing labor issues, let alone how to tackle them. • Inadequate compensation and vulnerability to mistreatment and forced labor, especially among women workers. Labor challenges in global supply chains are getting increasing media and policy attention yet practical solutions that respond to the priorities of both workers and business remain elusive. While many NGOs operate in this field, the collective effort is not yet reaching the most vulnerable and exploited workers. GoodWeave is addressing this gap by replicating its proven approach from the carpet industry to apparel supply chains. 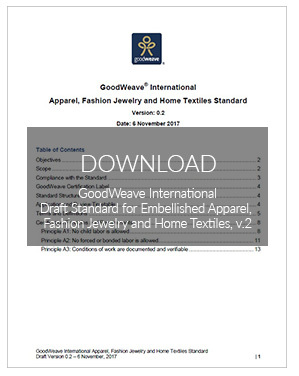 With support from the C&A Foundation, GoodWeave is establishing and testing a new sourcing system with C&A and other participating brands. Now midway through a two-year pilot, the program is active in four villages in Uttar Pradesh, northern India that serve as a hub for homebased work: Tilbegumpur, Kanwara, Jaee and Sali. • Targeted training on how to improve efficiency and quality to earn higher wages. GoodWeave is partnering with worker communities to offer educational opportunities to out-of-school children. Over 2,700 vulnerable children have benefited from our Child-friendly Communities program in the first year. More than 230 children have been directly enrolled into formal schools and an additional 600 children are now attending one of five informal “bridge” schools established to improve their learning levels and support their matriculation into mainstream schools. Another inspiring phenomenon is afoot – this effort is successfully breaking down barriers for girls and women whose education had been deprioritized or even forbidden. In response to community demand, GoodWeave has created classes for young women workers who had never attended school. Already, women who were using their thumb prints to sign documents are now signing their names. Results from the first year show promise to create a scalable program for the industry, with material improvements to worker livelihoods, health and education. By the end of the second year, the pilot is expected to reach and support a total of 7,500 homeworkers and 6,000 children. GoodWeave will seek to graduate the pilot to a commercial level roll out with a goal of making the GoodWeave System available industrywide. There is still space available in the pilot for additional partners. GoodWeave invites brands, apparel producers, donors and NGOs to be a part of this program to transform global supply chains. Meet some of our beneficiaries in Jae village.